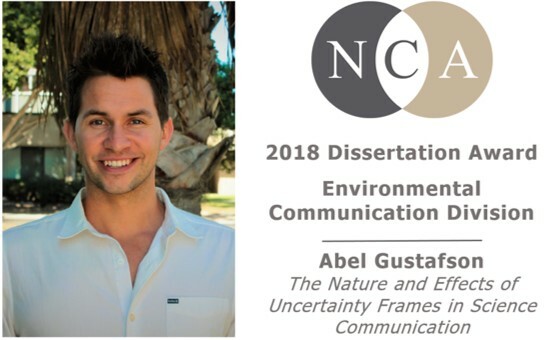 Dr. Abel Gustafson (UCSB Communication Grad Alumnus, Ph.D. 2018) recently received the Dissertation Award in Environmental Communication – awarded by the Environmental Communication Division of the National Communication Association. His dissertation is titled The Nature and Effects of Uncertainty Frames in Science Communication. In this work, he developed a conceptual framework for uncertainty frames in science communication and executed a large experimental test of their differential effects on beliefs and attitudes about scientific findings in a national sample. Dr. Ronald E. Rice served as his dissertation advisor. This work was supported by the Arthur N. Rupe endowment. Abel is currently a Postdoctoral Associate at Yale University in the Yale Program on Climate Change Communication.